A father gets into a desperate search to find his children who disappeared while going down stairs from their apartment in the seventh floor. In Buenos Aires, the bitter and methodic Roberto (Ricardo Darín) is a lonely man and the owner of a hardware store. Roberto collects bizarre worldwide news in an album as a hobby and his acquaintance Mari (Muriel Santa Ana) has an unrequited love for him, but Roberto is always evasive. One day, Roberto sees a Chinese named Jun (Ignacio Huang) being expelled from a taxi while he is watching the landing of airplanes in the airport and he helps the man to stand up. Jun does not speak Spanish and shows a tattoo with an address on his arm. Roberto heads to the spot with Jun and discover that the place belonged to Jun's uncle that sold it three and half years ago. Roberto goes with Jun to the police station, to the China's embassy and to a Chinese neighborhood to seek out his uncle but it is a fruitless search. Roberto lodges Jun in his house and after a series of incidents, he finds a delivery boy that speaks Cantonese to translate Jun and he learns the dramatic story of the life of his guest. "Un Cuento Chino" is a funny and dramatic film, with a refreshing story and excellent screenplay, direction and performances. 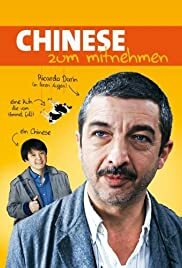 Ricardo Darín is one of the best (if not the best) Argentinean actors these days; Ignacio Huang is great in the role of a Chinese that cannot speak Spanish and Muriel Santa Ana is very sweet with her beautiful smile. This film is another proof that for making a great film, budget is one of the least components. Story, screenplay, direction and performances are the most important. The apparently absurd and bizarre idea of a cow falling from the sky on a boat is true and has happened in 1997 in the Sea of Japan, when a Russian cargo airplane with problems released a cow from a high altitude that hit a Japanese fishing boat that sank. My vote is eight.